Situated facing east to catch the prevailing tradewinds, as well as the morning sunrise, and evening moonrise, Hale Ke Kua (Tradewinds House) is a memorable way to relax, unwind and enjoy East Hawaii. Situated on a full acre only 400 yards from the ocean, you can hear the surf break, the whales sing, while enjoying the privacy that only comes with an one house on an entire acre. Built in 2016, this 3-bedroom 2-bath home offers all the quality and amenities you would need for a great experience, from the high-end stainless appliances and cookware in the kitchen, dining tables for six in the house and on the lanai, 65" TV with full DIRECTV channel package in the main room, and a 50" in the master suite. There is comfortable seating in the living room, and luxurious memory foam mattresses in the individually decorated bedrooms indoors, and on the 400 ft2 covered lanai, a couch, chairs, and seating and dining for six plus an outdoor kitchen. Without leaving the property a 12' X 40' salt-water lap pool, and even a regulation size bocce ball court are outside. Less than 30 minutes to south is Pohoiki Beach - the newest beach on earth, a 1/2 crescent of black sand. A must see. We are located about 12 miles south of Hilo, and 10-12 miles by air north of last years Leilani Estates eruption in Lava Zone 1. We are in Lava Zone 3 : 1-5% of Zone 3 has been covered since 1800, so we feel being we and our guests are out and away from any likely current risk. We are a professional couple from Bellevue WA. My wife is a retired school psychologist and I am still employed as a technology architect for a Fortune 100 company. We visited all the major Hawaiian Islands before deciding on the Big Island and have no regrets. The sheer size of the island means you don't get 'Island Fever', and the less urban environment combined with a more relaxed pace of life make every visit here a joy. It was our plan from the beginning to spend 3-4 months a year here, and share the experience with others the rest of the time. Because of that, the house was built and furnished to the same level as of our mainland house. You can see that in the cabinetry, the quartz counters, the furnishings. We have a well with 1 micron filtration and UV sterilization instead of a catchment system, unlike most houses here, so water is never an issue. We like to shop the farmers markets and the world-famous Suisan fish market, as well as enjoy the occasional Hawaiian grass-fed steak, so we made sure we had a fully equipped kitchen for whatever cuisine you like. With a 40-foot lap pool, either just cooling off, or getting in a little exercise is just steps away from the covered lanai. It's safe to say you'll spend a good deal of time here, because it also is a fully equipped outdoor kitchen with refrigerator, Weber Genesis grill with sidecar burner, and sink with hot and cold water. And although all the landscaping isn't fully grown in yet, we already have lemons and limes, and will eventually have bananas, oranges, figs, papayas, mangoes, and avocadoes. There's even a regulation Bocce-ball court for some competitive fun for all ages. Landline service is provided with free long distance to the mainland. Dial 1 before the area code. Full size LG front-loading washer with more cycles than we have fingers to count them, plus steam. Just put it on automatic. Full size LG gas dryer that, like the washer, has more cycles than we can count plus steam. Just put in on automatic. The carport accomodates one car, the circular driveway will accommodate ... many. There are 4 sets of towels per bedroom as well as beach towels for use by the pool. The living room has two large love seats and a glass top coffee table, all in an island theme. Perfect for reading or game nights. Kenmore Deluxe-labeled KitchenAid, stainless steel inside and out. Gas range with cast iron grille and bridge burner, Weber gas grille 4th 'Sear Station' burner and sidecar burner on the lanai. A Keurig machine and French Press brewing are provided. The Breville toaster oven also has settings for a pizza, bagels, broiling, reheating. And they really work. Expect to find normal pantry items, EV Olive oil, spices, maybe some rubs. We try to keep things current. You may find any number of condiments in the refrigerator including Balsamic vinegars. Dishes for 8 include dinner and salad plates, bowls, and mugs. Plasticware is available for use by the pool. All-Clad and Calphalon cookware, Henckels 4-Star knives. Blender, Food processor. 60" Circular solid teak dining table with seating for 6 is a wonderful gathering spot if you don't want to use the lanai. 65" Samsung 4K with Yamaha AV Receiver and Samsung Blu-Ray DVD, Polk Audio in-wall speakers. Rear surround speakers will be installed in November 2018. Also supports Bluetooth streaming. DIRECTV with full channel package including HBO and Showtime. The TV uses a Yamaha AV receiver with Polk in-wall speakers. Local FM and DIRECTV music channels or you can hardwire or Bluetooth in from your own devices. Cards, board games, including Scrabble. Adding more every time we visit. Not sure I'd call it a library, but there are a dozen or so DVDs, including the Eric Clapton 'Crossroads' Festival music videos. The houses sits on a full acre property with many young fruit trees including banana, mango, papaya, Kaffir lime, avocado, orange, & more. They may have fruit during your visit, if so please enjoy. The is a large concrete deck surrounding the pool and two chaise lounges with cushions. We try to hang the cushions on the lanai to protect them from rain and sun damage. There are several public courses in the Hilo area. 12 X 40 foot lap pool. It averages 4-5 feet deep so sorry, no diving. Salt chlorination system means no chemical odor. Pool service is normally Thursday. In-pool LED lighting for night swims. Hawaii is about getting away, slowing down, and enjoying life with family and friends. We conceived and built Hale Ke' Kua to be that place. Our goals are to provide our guests with a self-contained and immersive experience, and to provide a home base for exploring the amazing Big Island, Hawaii. The amenities and equipment we offer exist to help you achieve those goals. If we have overlooked something or if there is something extra that we could add, please let us know. My family really enjoyed our stay at this home near Hilo. The home felt new, was very modern, and was extremely well organized. 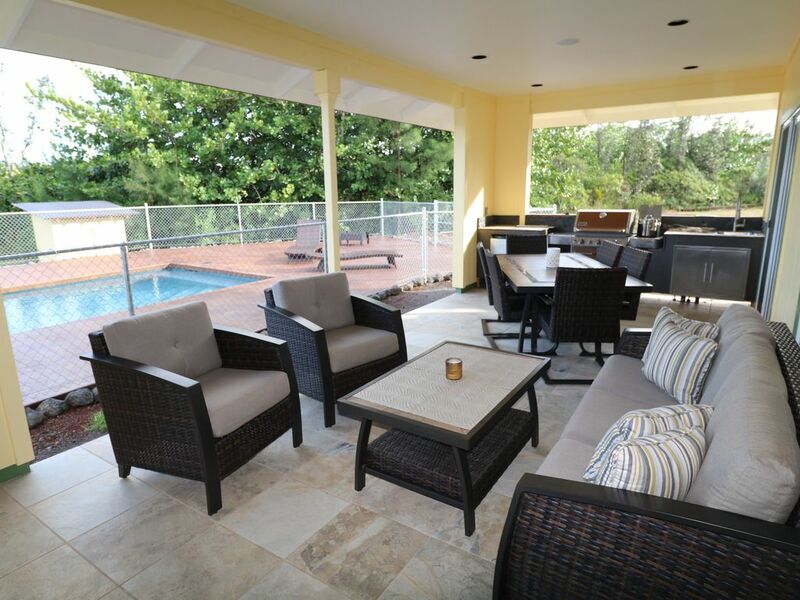 The lanai and pool area were a highlight of our stay. We would definitely stay here again if we are back on the Big Island. Thank you for your very kind review. We try our best to provide the best possible experience for our guests. Words like yours are a validation of that effort. We sincerely hope you are able to visit us again. This was a wonderful property. We vacationed with our adult children. We were 5 adults. Plenty of room. This was our first experience with a VBRO, I will definitely do it again. The owners were informative and accomadating. Thank you for making our first experience in Hawaii an amazing one! The home was perfect for our family of 4! We stayed for three nights. It was clean, comfortable and in a very pretty neighborhood. The owners were incredibly helpful and responsive! Bev and Richard gave us recommendations on restaurants, sights, activities, etc. We followed just about every piece of advice they gave us and were not disappointed! Would highly recommend! I don't think I have enough words to describe this experience. Richard was reachable for any and all questions for the entire stay. The place was spotless, the layout of the house is well thought out, the pool was refreshing to use throughout the day, the kitchen was stocked by a gourmet chef AND there is a bocce ball court! HELLO! The reclining chairs for watching the playoffs were the cherry on top of this treat! Bernadettte, Thank you for your review. We built and furnished Hale Ke' Kua to be the kind of place we wanted to experience when we were renting a vacation home, and in so doing be able to share that experience with others. We are glad you were able to enjoy what we offer, and to join our growing family of 5-star guests. We had a wonderful time during our stay. Richard and Bev were wonderfully helpful. Bev quickly answered my questions about the cookware and dishes at the property prior to our reservation (my daughter has dietary restrictions and we were concerned about cross-contamination). The house was exactly as represented and contained everything you need for a getaway. We made every meal during our stay at the house. The pool was lovely . . . perfect temperature and all ours for 5 days (the kiddos were in heaven). The wifi operated better than they said it would, and we were able to stream tv shows on our ipad in the master bedroom after the kids went to bed. I recommend this rental to any family looking for time together away from the stress of everyday life! Richard and Bev, you have an amazing house and thank you for hosting our family. Richard said you would be back this fall . . . I hope you enjoy your time at your personal resort! Great! Very private, close to town Pahoa, Keeau, for supplies and not too far to Hilo for anything. It was amazing swimming at night to the light of the lava..... true lava lamp!